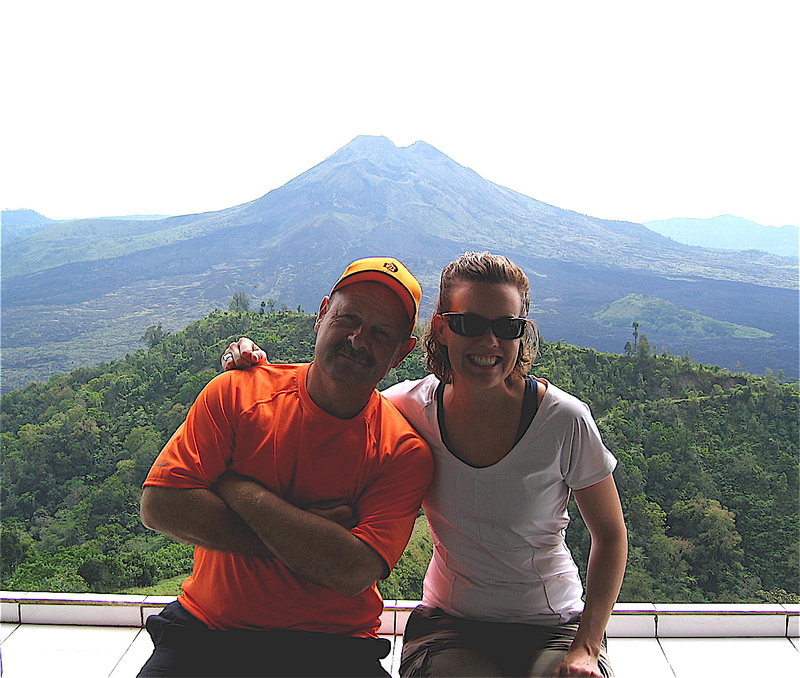 As the news fills with stories about a volcano threatening to erupt in Bali I am reminded of the two trips we made to Bali and in particular of the warm and wonderful people we met while we were there. The children in the school we visited. My friendly and professional golf caddy Sunlini. The workers at the farm where we learned all about cocoa production. The family preparing for a wedding who invited us into their compound to watch all the festivities and meet the bride. These joyful kids cooling off in a stream. The farmers busy at work in their fields. 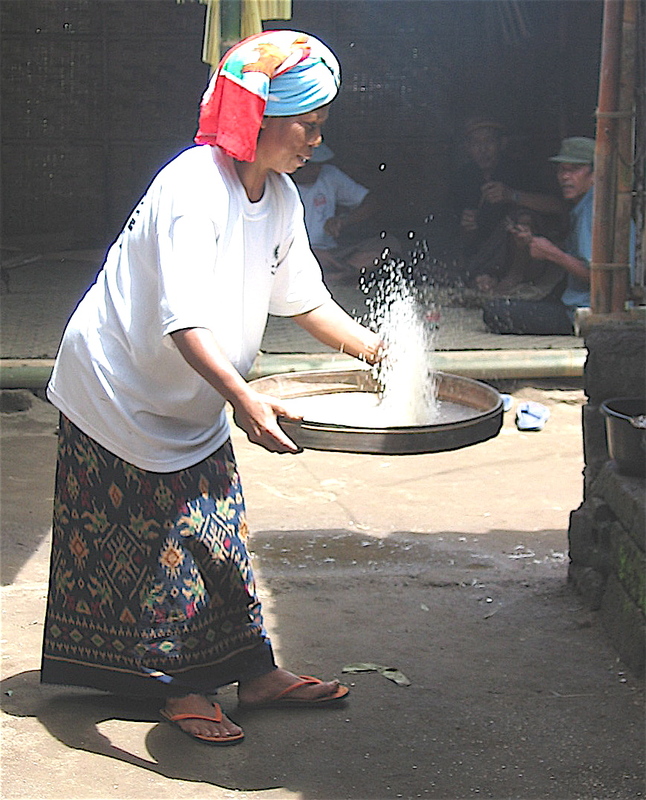 Cooks getting rice ready to feed their families. This hardworking woman giving massages and pedicures on the beach. Wayan one of the characters in the book Eat, Pray Love by Elizabeth Gilbert. 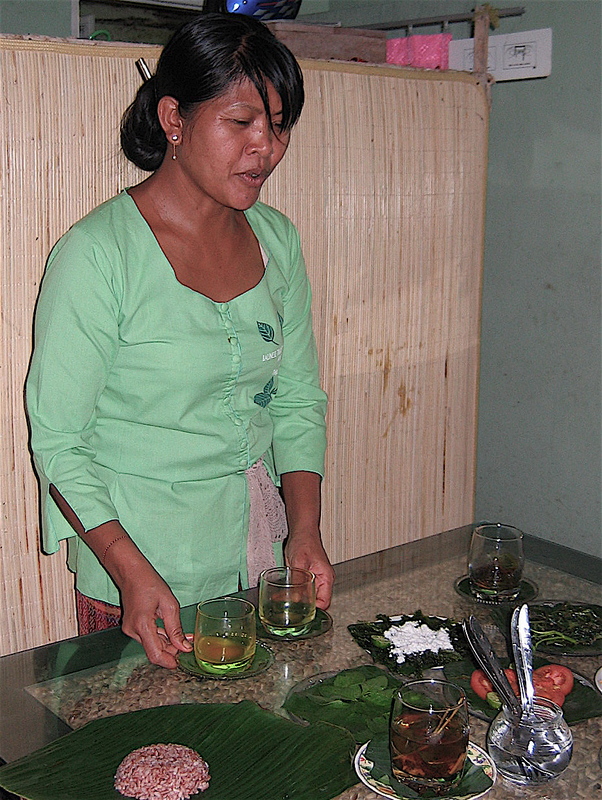 Wayan served us a healthy lunch at her restaurant. 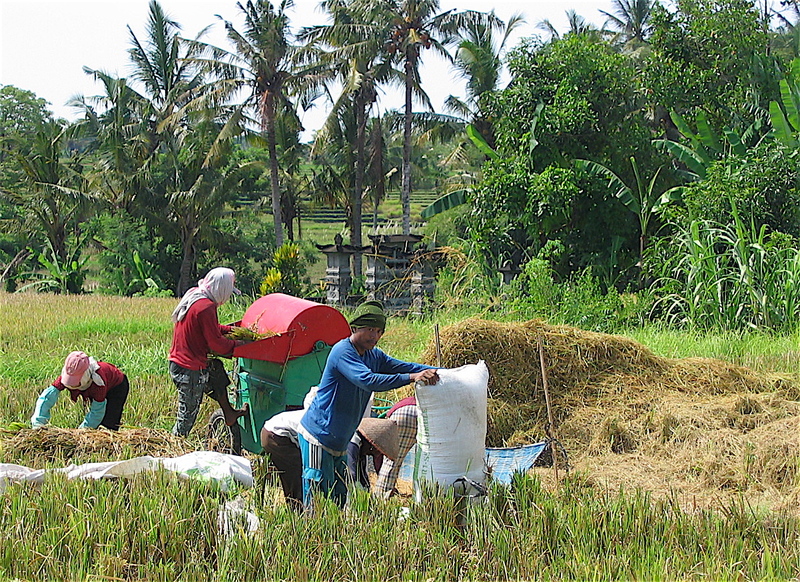 I am especially concerned because many of these people in Bali rely on the tourist trade for their living and the possible volcanic eruption will deeply impact their sources of income as tourists flee. I hope these folks will be safe and wish them all the best as they deal with the potential natural disaster. If I’d have been on the Jeopardy television game show I could have earned $2000. 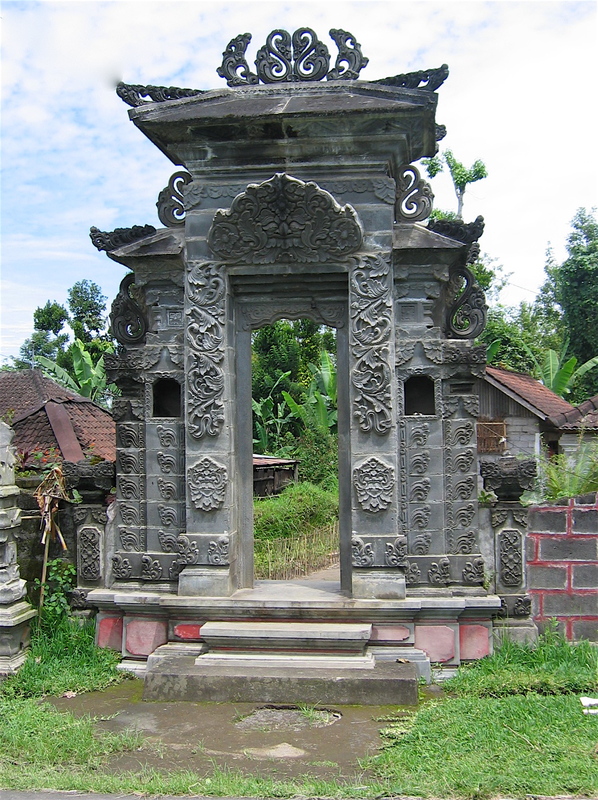 Recently in a category called Houses of Worship contestants were asked to identify the Indonesian location of an island temple shown in a photograph. I knew the answer was Bali because Dave and I have vacationed twice at a resort right near the Pura Tanah Lot Temple. We had a beautiful view of the temple built to the sea gods from the resort golf course. I took several photos of the unique house of worship. None of the Jeopardy contestants knew the answer was Bali so if I’d have been on the show I would have won $2000. Wayan was my favorite character in the book. 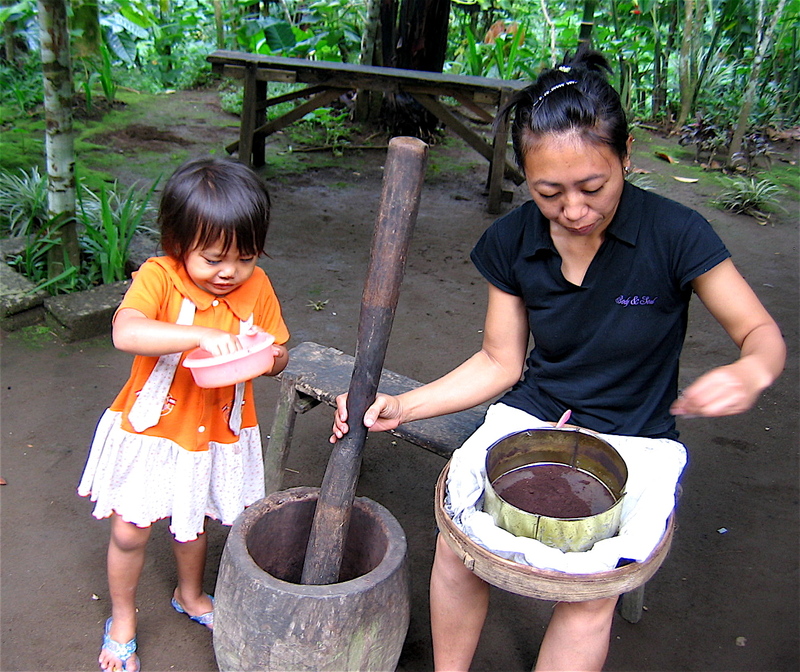 She’s the proprietor of a small healing shop and restaurant in the city of Ubud. Elizabeth Gilbert is riding her bicycle in Ubud and falls injuring her knee. She goes to the shop for some ointment and ends up making friends with Wayan and her daughter, Tutti. Wayan has left an abusive husband and is having difficulty surviving, since in Balinese culture divorce carries such a stigma. 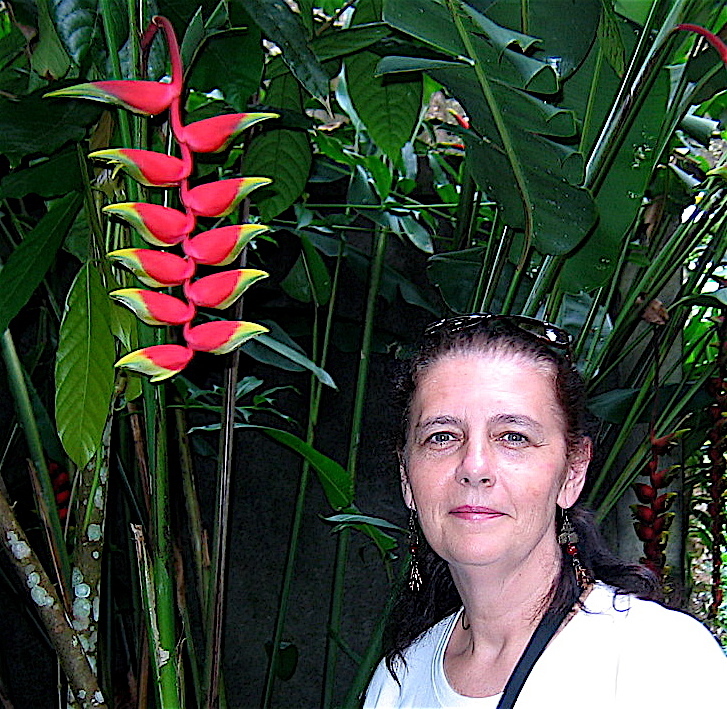 Wayan is often forced to move her business from one site to another and so has trouble holding onto enough established clients to be financially solvent. Elizabeth Gilbert puts out an appeal to American friends to donate money to buy Wayan her own shop. It doesn’t take Gilbert long to collect $18,000. 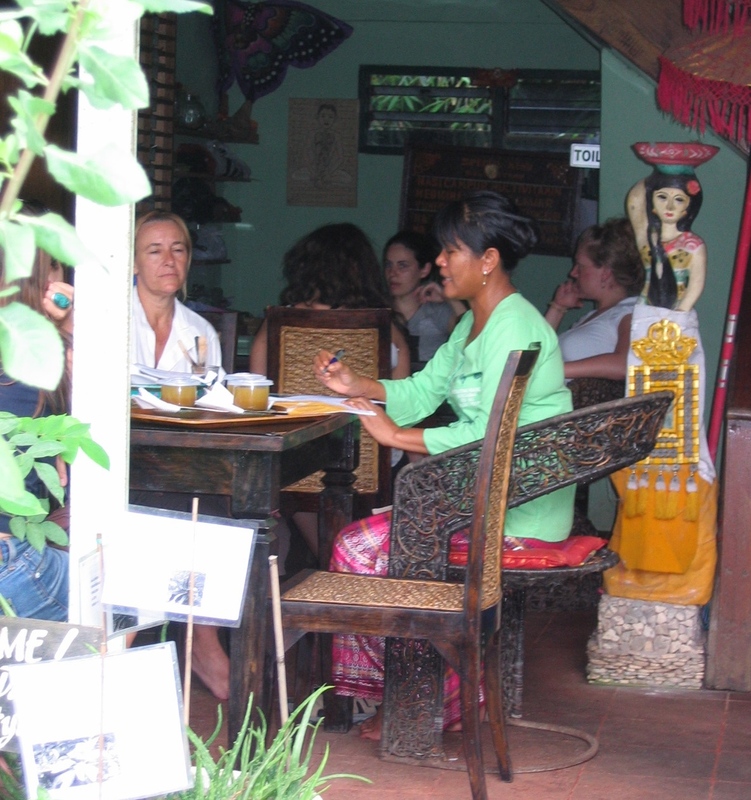 Before she leaves Bali, Gilbert sees Wayan established in a mortgage free two-storey building. It isn’t hard to find Wayan’s shop. Gilbert’s book says it is a few doors up the road from the Ubud post office and that is exactly where my friend Kathy and I found it. 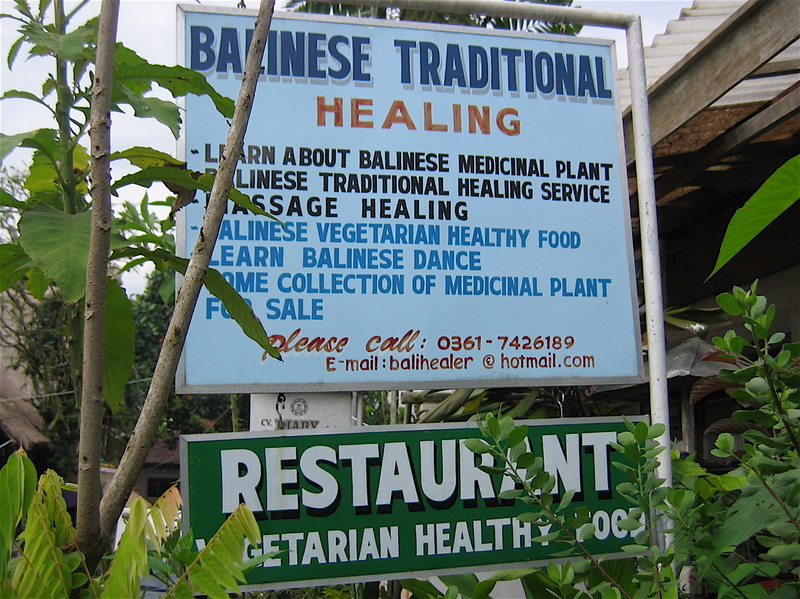 The hand painted sign out front invited us in to have a massage, learn Balinese dance, buy medicinal plants, eat a healthy Vitamin Lunch or be healed of whatever ailed us. Huge pots on the shop’s front patio contained various herbs like ginseng, jasmine and aloe vera. 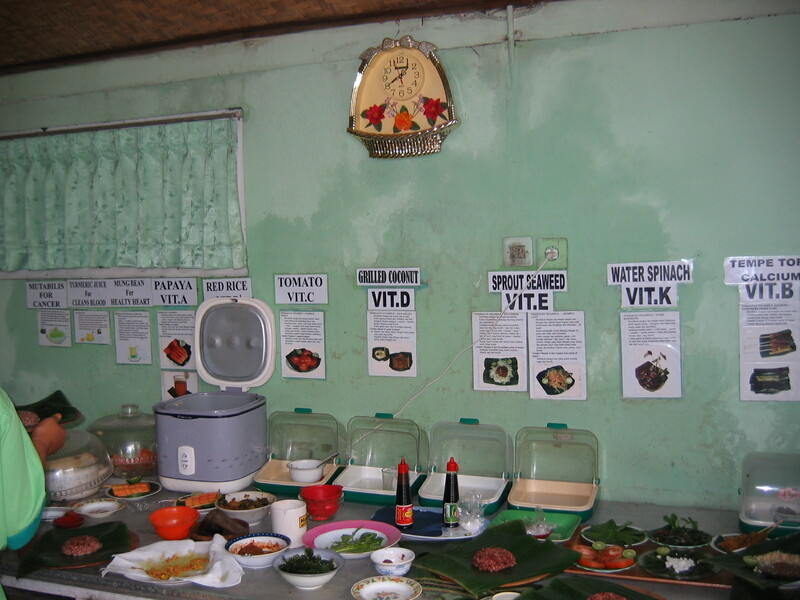 Each pot had a sign that told you what illnesses that particular plant could help to cure. We wandered inside. The restaurant had three tables. Wayan met us and after escorting us to the one table available asked if we had come to eat or be healed. We told her we were hungry after a morning of wandering the shops of Ubud and so she and her assistant began bringing food to our table. 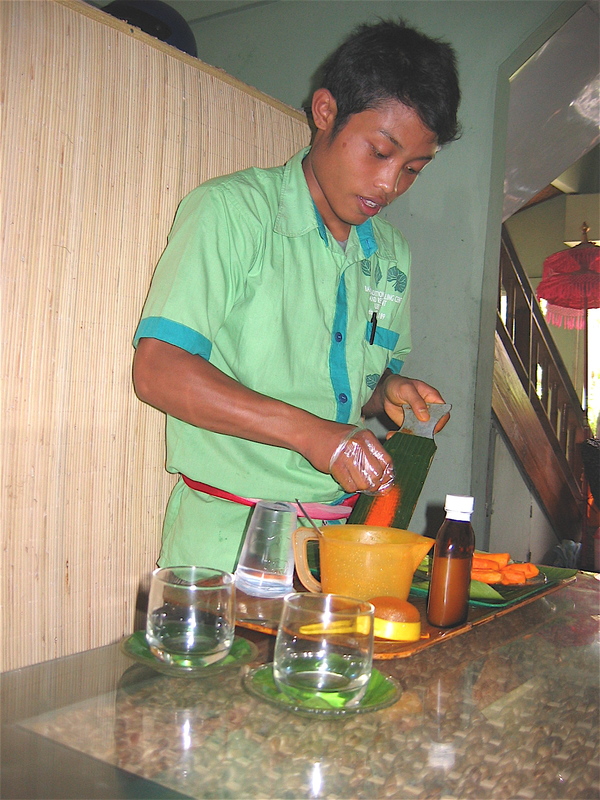 They grated tumeric and mixed it with ginger, honey and water to make a delicious juice. They brought us three different kinds of seaweed, each flavored in a different way. We ate uniquely spiced melon and tomato served on banana leaves. We had rice and salad. 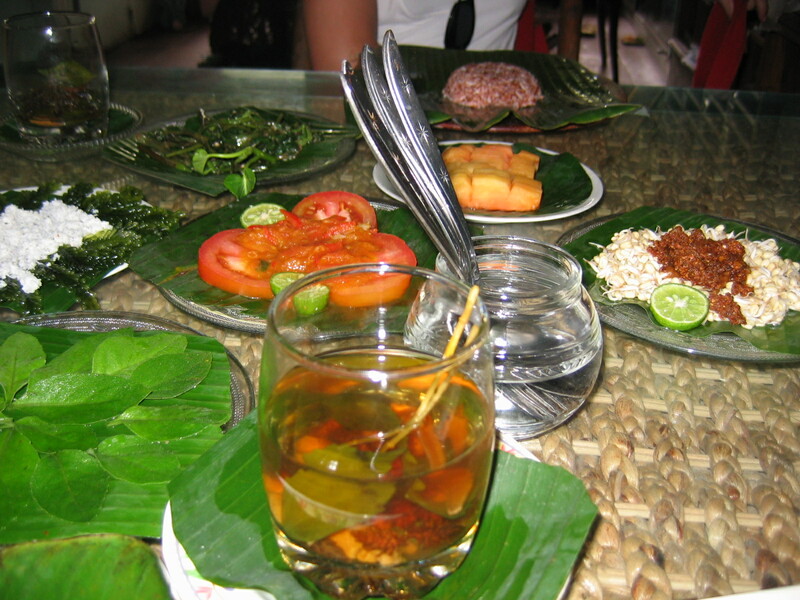 As each dish came to the table Wayan told us whether it was good for our stomach, kidneys, hearts or love lives. Wayan said for only a small, added cost we could have a healthy body check at the end of the meal, but she was very busy when we finished eating doing body checks for a group of French women sitting at another table. 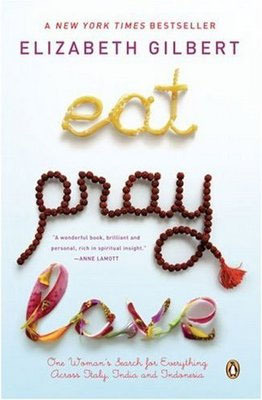 I noted one of them had a French copy of Eat, Pray, Love tucked into her bag. The book has been translated into more than thirty languages. One of the things I like to do whenever I travel is read a book set in the country I’m visiting. It makes the place come alive for me. I don’t always get a chance to actually step into the pages of the books and meet one of the characters I’ve read about. Happily I was able to do that in Bali. Our recent biking adventure in Toronto brought to mind other memorable biking trips in recent years. One was in Bali. It was probably the easiest bike journey we’ve done because it was almost all down hill. 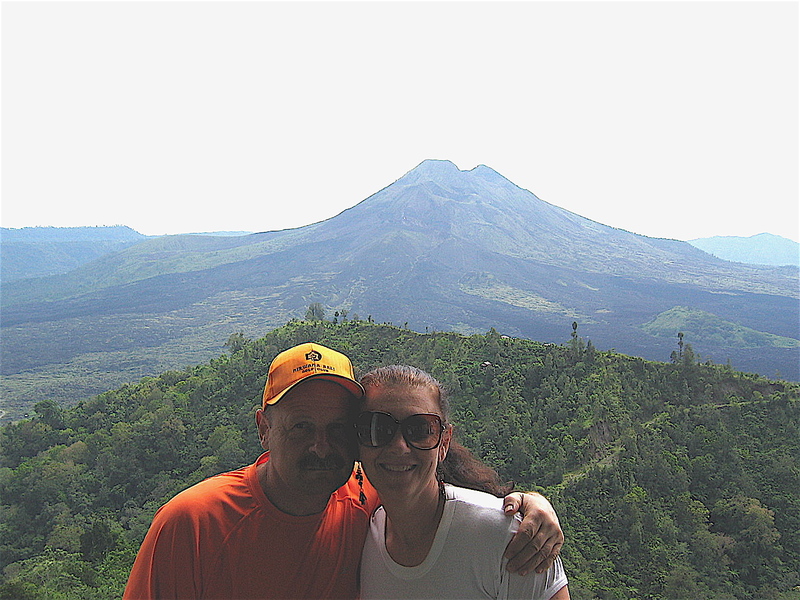 Our trip began at the top of Mount Batur, a volcanic peak. Here’s Dave with Kathy Glenn a friend who went on the tour with us. We started out with a breakfast of banana fritters and coffee so thick it was like syrup before setting out on a four-hour bike trek through the villages of Bali. 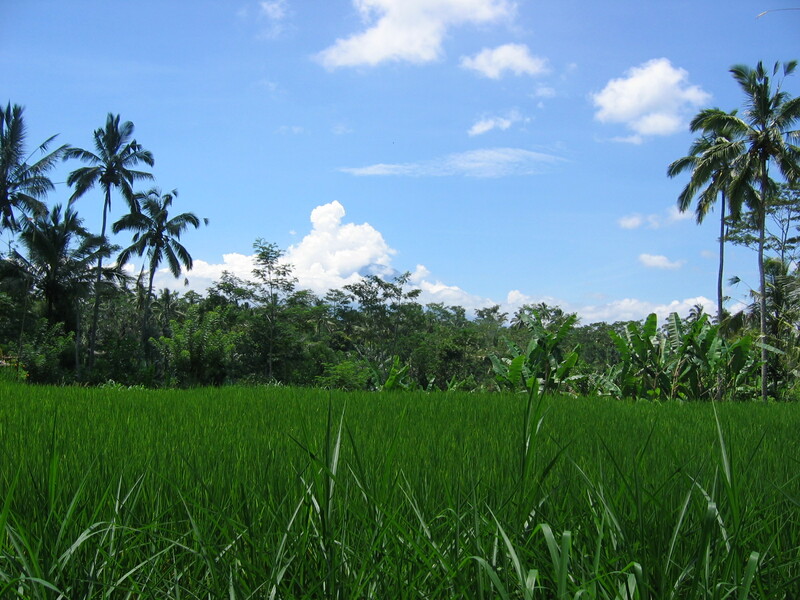 It was a gorgeous day and we got a great view of the Bali countryside from our bikes. We saw lots of beautiful flowers along the way. 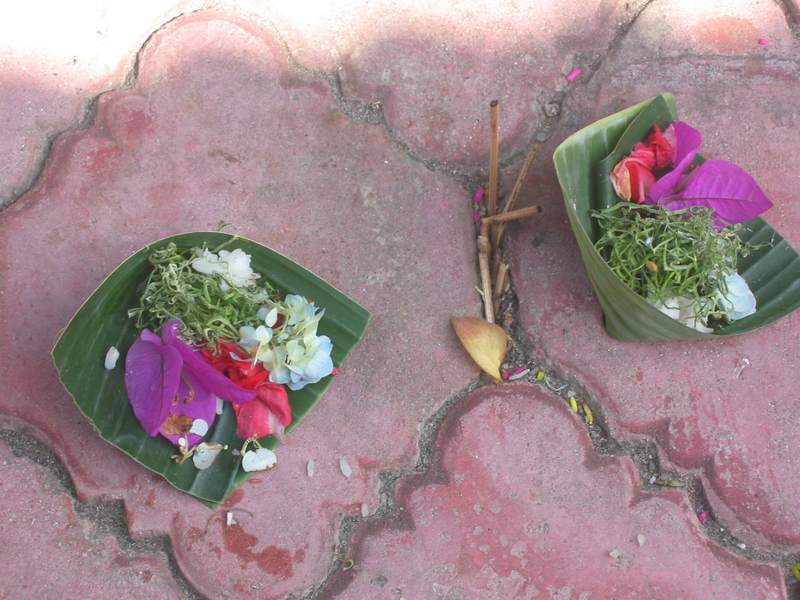 Women in Bali use the flowers to fill offering baskets they weave to place outside their homes and businesses as a kind of prayer each morning. 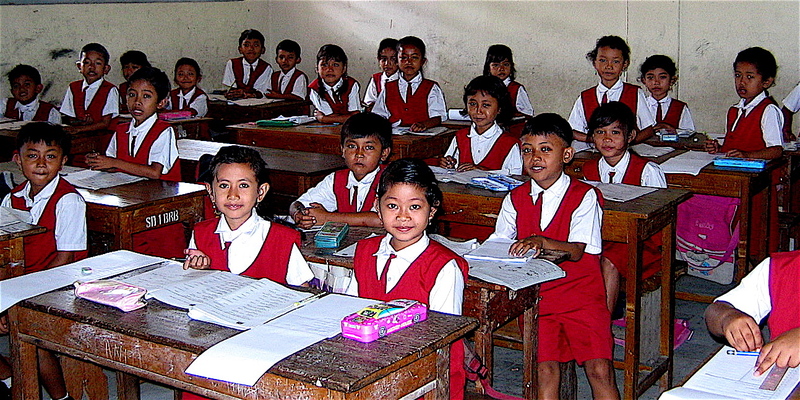 We stopped to visit a school and learned a little bit more about how the school system works in Bali. Here I am with a group of grade six girls. The school had no books, no lights, no air conditioning, forty children to a class and teachers who are paid a minimum government worker’s salary. 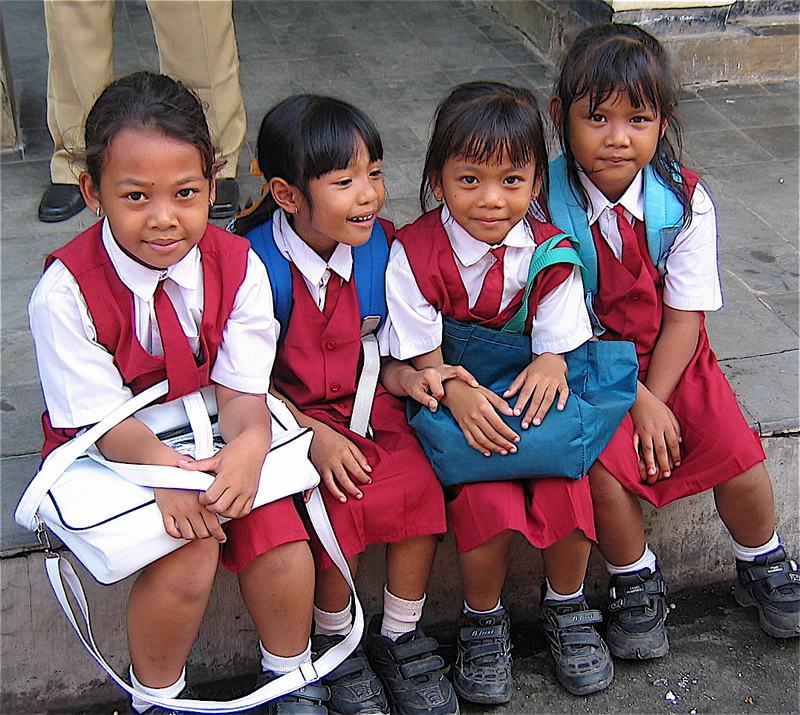 Most children only complete elementary school because the government supplies the uniform and books and the parents don’t have to pay anything at all. Anything past sixth grade is at the parents’ expense. These elementary students said good-bye to us as we left. These boys obviously weren’t in school, but were sure having a good time. 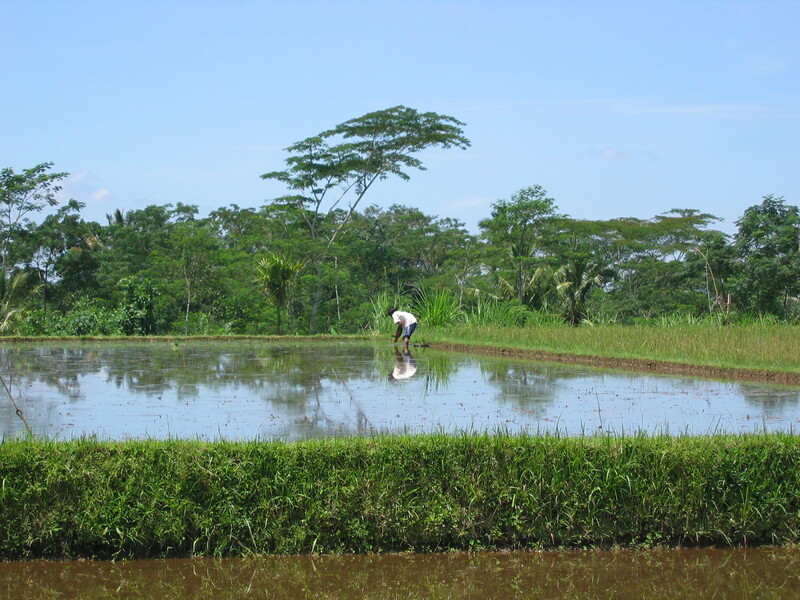 Some parents keep their kids home from school because the commute is too far or because they want them to work in the rice fields with them. And harvesting them. And winnowing their rice for eating. We visited a cocoa plantation and tried some of the thick rich chocolate. We passed many family compounds. Most have highly decorative entry ways. The compounds all had one and often more altars in it for making offerings and petitioning the gods. 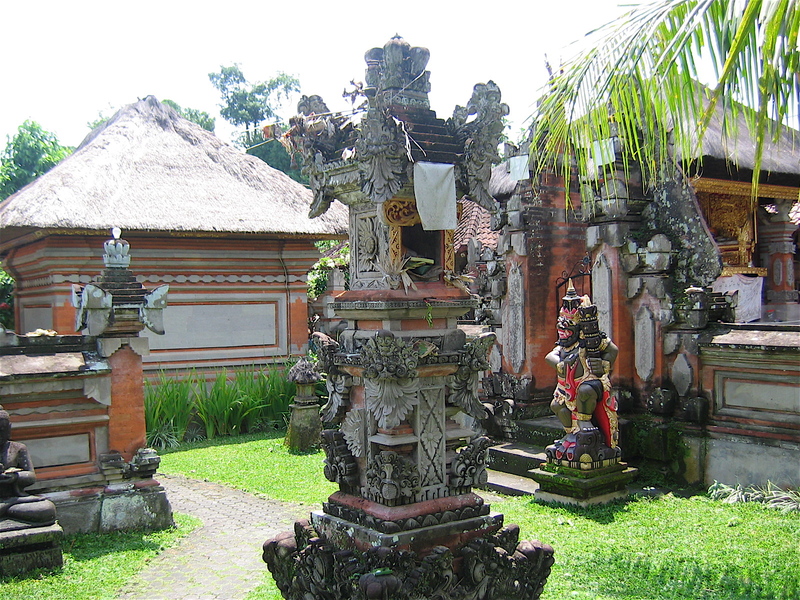 Unlike the rest of Indonesia which is basically Muslim, Bali is Hindu, but they have their own kind of Hinduism, mixed with animism. 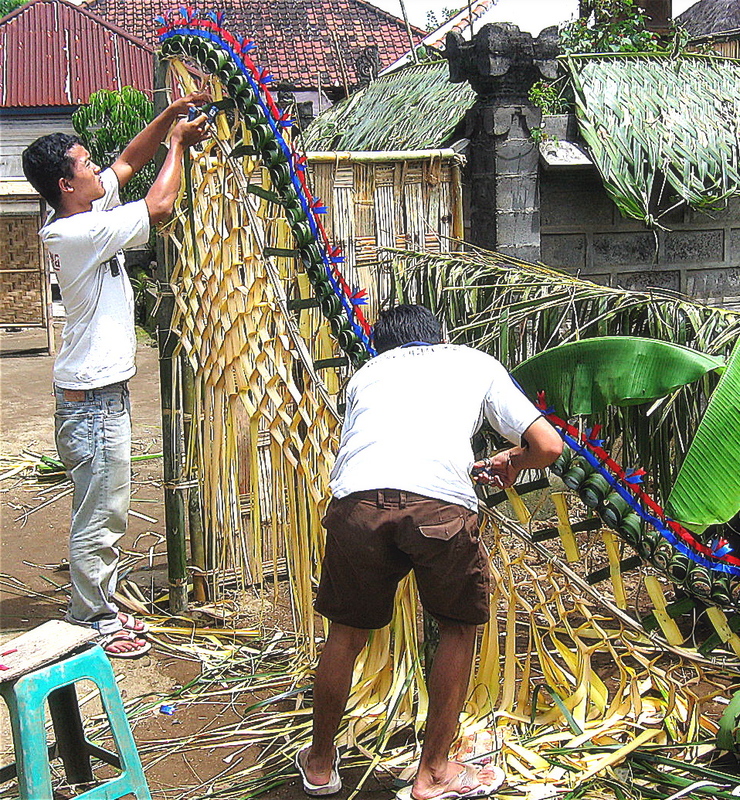 These men were decorating the gate of their family compound for a wedding. They invited us to come in and watch the family preparing for the upcoming festivities.The bride was hiding in the kitchen and only poked her head around the corner. She looked about eight months pregnant. Our guide said men in Bali like to know a woman is fertile before they marry her so women are often pregnant on their wedding day. 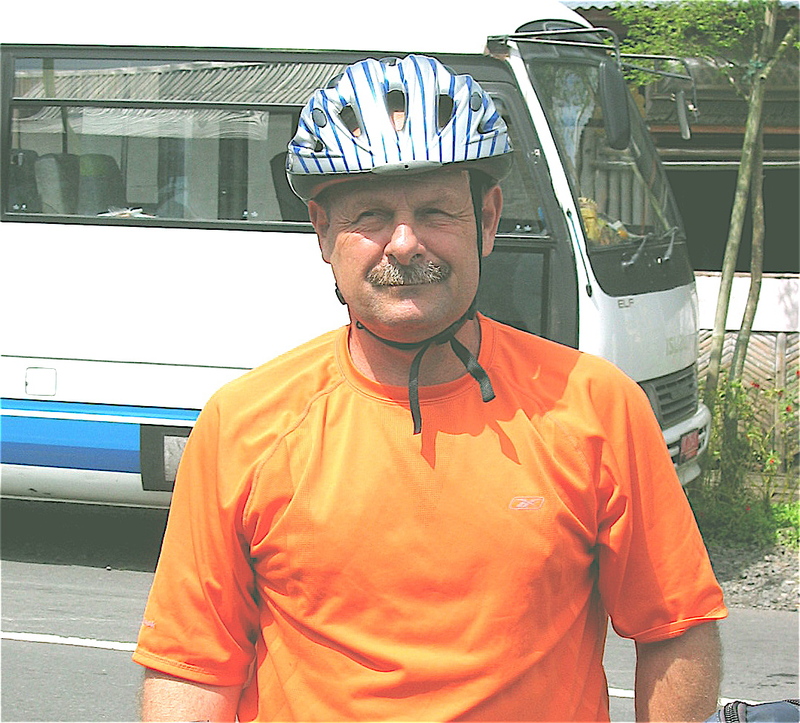 Biking was a great way to see the sights of Bali. After the bike trip we recuperated with massages at a spa. The owner took a photo of the three of us.